It’s not an uncommon sight to see a pergola out in the yard these days. More often than metal pergolas though, you will find them made of wood. This is because these wooden structures are easily worked and bring a natural look to your yard. However, metal pergolas are becoming more readily available due to the pergola kits that can be found in hardware stores and home centers. This is a great development for home owners looking to add something special to their yard. 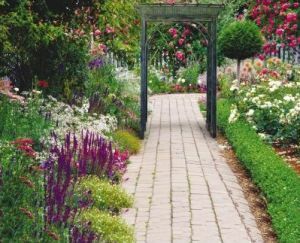 Pergolas have a distinctive look to them, which can bring a lot of visual interest to landscaping or even the house itself with an attached pergola. Metal pergolas allow for a much wider range of looks, styles, and designs, increasing the flexibility a home owner has in shaping the look and useability of their landscaping. Whether you are looking to upgrade the look of your patio, garden, deck … or just need an area of moderate shade out on the lawn … a metal pergola might be right up your alley. Wooden pergolas are a mainstay in outdoor structures. Easily worked, wood makes for a great material to build a pergola by the average handyman. All you need are a few tools which most of us already have. The only things you really need are some spare time, an idea of how you want it to look, some pergola plans to work from, and a friend to help lift some of the heavier structural elements. The most difficult thing with wood pergolas would be determining which type of wood is right for you. With countless options, all with their own unique look, strength, and ability to withstand the weather, it can be a rather involved process to choose between them all. Generally though, a few wood types are used, more for their weather and pest resistance than for their looks. Redwood or Cedar pergolas are often seen because of how well they fare against moisture and termites. Teak is another common one for much the same reasons. With metal pergolas though, construction can be a lot more difficult. Very few handymen know how to shape and weld aluminum. It relies on tools that aren’t readily available to the average home owner. Because of this most of us will be stuck with a metal pergola kit, rather than being able to design and build our own from scratch. That isn’t as big a deal as it might seem at first though. There are a wide variety of looks available, and because of nature of the metals used, there may even be more variation in look and feel in metal gazebos than is possible just with wooden ones. While wooden gazebos look quite good on their own, these already unique designs can be taken even further. That extensive variation in look is because the metals used, such as aluminum, are very strong for their weight or have other distinctive characteristics. After all, they build airplane frames from aluminum because of this strength to weight ratio. Due to the nature of the materials used, an aluminum pergola can have more elegant spans and a more open feel to it. On the other hand, a wrought iron pergola is much heavier than even wood. The beauty of wrought iron though is that it melds a natural feel to an ageless material. While wrought iron pergolas can be heavy and very difficult to find and install, they have a distinctive look that you won’t get with any other material. Perhaps the most important consideration with a pergola is how it’s going to deal with the sun, wind, rain, sleet, and snow it will face out in the yard. Because a pergola usually doesn’t have a roof or cover to protect it, the structural elements will be constantly exposed to the full effects of the elements. This makes choosing a weather resistant material very important. Again, this is why wooden pergolas are often made of teak, cedar, or redwood; as those types of wood are well suited for outdoor applications. With metal pergolas, this is sometimes an overriding factor. Aluminum is often the material of choice due to it’s ability to withstand rust and corrosion. This is why aluminum is a much more widely used material than steel for instance. A steel pergola will have to have a finish maintained to prevent rust from destroying the structure. Wrought iron is similar to steel. Not quite as prone to rusting, it is a more common outdoor material though. Sometimes, the rust and weathering is seen as a good thing with wrought iron, so long as it doesn’t undermine the structural integrity of the pergola. In most cases though, wrought iron should have it’s finish maintained to keep it in good shape. Usually this finish will be a black paint, though more and more other colors are used with wrought iron. White and dark earthy colors are some of the most readily found of these. There are some other natural and artificial materials that are used in building pergolas. PVC and vinyl pergolas are becoming much more readily available for instance. They are more lightweight materials that have excellent protection from the elements. Make sure if you go this route that they are properly protected from ultraviolet rays though, as that is one of the main enemies to either of them. With metals, you may sometimes find a copper or bronze pergola. In most cases this won’t be copper or bronze through and through, but rather a steel or aluminum structure that is coated with a thin film of the other metal. Copper is unique in that the weathering that happens to it is actually the main draw. The red metallic color turns to a duller green over time, and this can bring quite a beautiful effect to your garden. Bronze can have a very aesthetic look as well, but tends to not look as natural. The drawback with copper is it can be rather expensive. This means you might have to go with a small pergola rather than one as large as you would have preferred. Whether or not the visual properties of copper are worth this tradeoff are going to be highly situational. It’s not uncommon to see pergolas being used as trellises or combined with arbors. Normally it’s wooden pergolas that are used this way, due to the natural look and feel of the material. It just looks great with flowering or fruiting vines crawling over it. Often the cold, metallic look doesn’t go so well in the garden. As mentioned before, copper’s look can meld in well over time, making it a good choice for trellising. Wrought iron pergolas also go great in gardens, though they aren’t used for trellising as often. It’s the look of the wrought iron itself, as well as the distinctive styling they tend to have, that fit in so well in natural environments. Perhaps the biggest problem with adding a metal pergola to your yard is finding one that is suitable. While there are a lot of kits in home improvement centers, they often are rather bland and boring. The look they bring is often just to mimic a painted wood pergola, and really, what’s the point in that? Going online can widen the amount of options you have tremendously. While shipping costs can be very high, you have so many more vendors and manufacturers to choose from that the competition keeps the overall costs lower in most cases. This can mean you can find a great deal on a beautiful metal pergola, but it will take quite a lot of research into which manufacturers provide quality components and stand behind their guarantees. Remember that the lowest price may be indicative of a good deal, but it could also mean that you’re not getting a high quality pergola.